“Oh goodness, yes!” Her eyes lit up. “I have been since I was a little thing. My first…” Her sentence interrupted by the conductor. “Castle Hill Avenue next” He announced. Disappointment washed over her face as she watched him gather his bags in his hand. The talk was a delight and it just began. He pursed his lips with a sigh. “Sorry. This is my stop…” He said, sadly. “Well. Agnes, I guess we’ll have to finish this some other time…bye” He waved and walked out the door. Agnes, lifted her glasses above her head, smiled and followed him down the platform with her eyes. Once the train left in station, she opened her book and continued reading. Exhausted from standing on the long lines and shopping, Owen rushed down the stairs to the platform only to be met by hordes of hot, sweaty bodies. “6 train arriving in one minute,” the automated voice rang out. No chance of sitting today, he thought. The train rushed into the station with a gush of steaming heat ahead of it. A few strands of blond hair streamed across Owen’s face, like microscopic ribbons, from the woman in front of him. When the doors opened, the herd of humans poured out of the doors stampeding all who stood in their way. Though he stepped to the side, he couldn’t avoid the smearing of lotions, perfume, sweat and dirt he received. Owen looked down at his shirt, took a deep breath, clutched his bag handles tight, then pressed on his pocket to crank up his music and stepped into the car, then assumed his position as the next sardine in the can. He tried his best to ignore the tourist with their camera phones, maps, backpacks and bewildered looks…but he couldn’t. Especially since a group of acrobats were standing on his feet, crushing his bags, had their map in his face and elbows extended, taking pictures and all without missing a beat. Lord, I’m about to lose my religion! he thought. At that very moment he looked through the window of the next car and saw…What’s her name again? Agnes! That’s it!” The thought calmed his heart and made him smile. The train passed through Manhattan and entered the Bronx, he finally got a seat but when he looked through the window, the woman was gone. Did I imagine it? he thought. Three weeks later, while seated in the corner seat, he noticed her sitting next to him in the next car in the same seat; she was reading a book. She ran he fingers through her hair then turned the page. Agnes looked up briefly to see Owen in the car beside her. She was puzzled for a moment as to why a man was staring at her. Then she remembered…she smiled at him, and then continued reading but the warm smile remained with her for a few more stops. Two weeks later, juggling 2 bags full of melons, pineapples and peaches, Owen shot down the subway stairs and crashed into a wave of straphangers coming up. “Excuse me…excuse me!” he announced. But the current was too strong. He was struck mid-way, being pushed to and fro. He reached the bottom just as the train left the station. “@#@!,” he slumped back against the column and dropped his bags. “Uptown 6 train arriving in 1 minute,” the machine voice called. He inhaled deeply and stepped dangerously close to the edge of the platform. His t-shirt waved across his chest as the hot breeze entered the station before the train. Owen closed his eyes and imagined himself standing on a beach. When the train stopped, he opened his eyes to see Agnes sitting inside. Stepping into the train, he immediately chuckled. “It’s you again.” She blushed and raised her hand to her mouth, covering her delight at his remark. “So, are you on a lunch break? It was noon. A serious look fell on his face. “Really…?” There was a long pause. 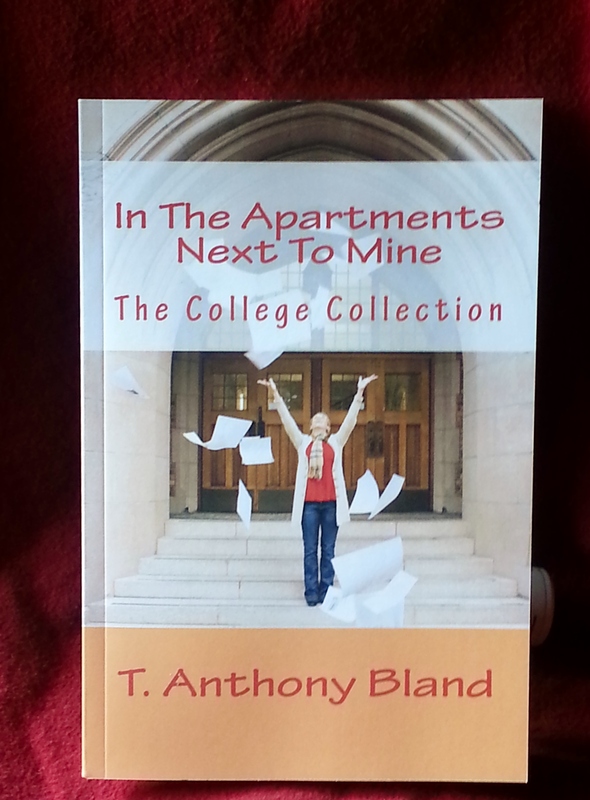 “In The Apartments Next to Mine” Book Excerpt 2. 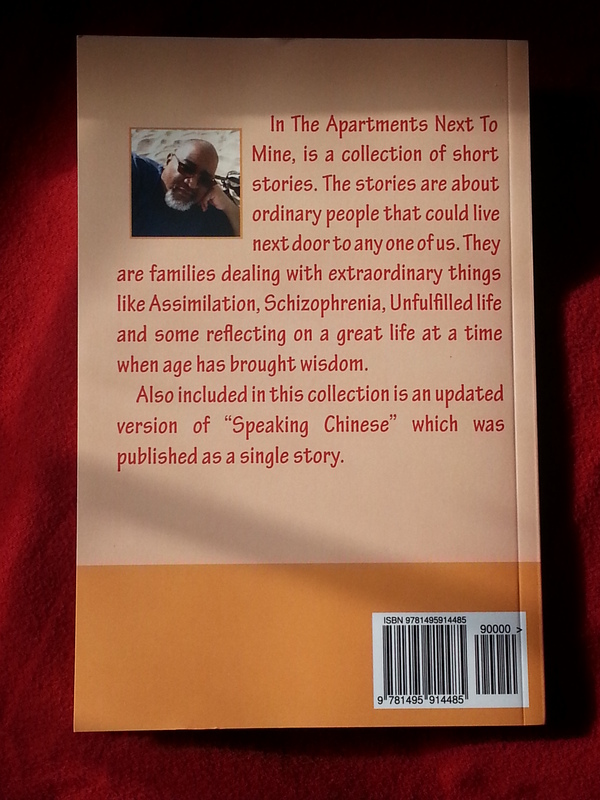 “In The Apartments Next to Mine” Book Excerpt 1. “I don’t know what I’ll do as far as a career, but this is just the beginning of my life. I hope I’ll be able to go home like my Dad suggested years ago. Thank you all but, I can’t take any more questions. I have a plane to catch.” With that said he stepped back, turned and fell into Cynthia’s waiting arms. “That was the bravest thing I have ever seen,” she said as they walked through the sea of flashing lights. Hailing a taxi, they headed for the airport. During the entire flight, neither one uttered a word – they just watched the flight attendants in navy blue suits walk the aisle passing out peanuts, sandwiches and drinks. Caleb took his infant size pillow and laid still against the window all the while trying to ignore the six year old kicking the seat from behind and the rank smell of the adult diaper needing to be changed from the seat in front. Cynthia just laid motionless watching the in-flight movie until she fell asleep. “Yes ma’am,” the nurse replied. “He’s in Room 323.” With butterflies in her stomach, she pushes the door slowly entering with Caleb following. “Hi Daddy,” She reached back for Caleb’s hand. “There’s no need for that. You’ve made the right choice now. I prayed for your change of heart years ago. I’m just glad I was able to see it happen. Thank you son, for your witness to the video game industry.” After shaking hands, they said goodbye. “I’ll see you soon Daddy, I’ll call you from Austin too,” Cynthia said, waving on the way out the door. They stayed at the Bowmont Ranch until Monday morning. Boarding yet another plane, they headed to Austin, Texas. Once again, upon landing, they rushed to a taxi, traveling in the bright Texas sun. It wasn’t long before they approached the college campus, now surrounded by the NFL Officials, news media, helicopters circling and thousands upon thousands of ‘Longhorn’ fans all chanting Jedidiah’s name. Like the woman who pushed her way through the crowds to get to Jesus, they too were pressed on all sides. Finally making it to the office, they were escorted to the field where the press conference had already begun. Unable to make their way to the stage where the rest of the family was, Caleb and Cynthia managed to squeeze up front just behind the ‘press corps’. There standing before him was the youngest of the ‘James boys’. The once chubby, ashy, slow poke had become a man. A literal tower of strength, his deep brown muscular frame glistening in the sun, he leaned on the podium with his left hand – his left shoulder and profile resembling the regal look of Daddy. Jed leaned forward with his hands cupped over his eyes as he spotted his big brother and smiled. Putting his hands down, he continued with the conference. “You were going to tell us what we’ve waited to hear all weekend,” one reporter comments. “The draft Jed, the draft!” they shouted. “It’s okay Jay. I can do it,” Jared said. “No, it’s not safe. They might hurt you! Jared, come back!” he yelled desperately. But he was too late. The police burst through the door smashing Jared into tiny bloody pieces. Henry tried his hardest to restrain Jay but he broke loose and ran for the first officer through the door. “Just what? !” Arresting him for nothing! She interrupted. “You bust in our home, shoot my child and now you put guns to my husband’s head, frighten my daughter and tell me you’re just…just what? Just gonna make a statistic of my husband? You claim he’s resisting arrest, why would he need to be arrested? !” Her heart moved like a commuter train within her. Her words were full with rage. Then before the police could answer, the paramedics cut in to remind them of something far more important. “I have a pulse…he’s still breathing and I need to get this man to the hospital now!” With that the sirens rang through the streets as the ambulance driver tried to break sound and speed barriers to get Jacob to the hospital. Henry was still arrested, arraigned and released, then met Nicole at the hospital. Mercy General was known for many things but being the best hospital was not one of them. However, Jacob received excellent care partly because he had become a local superstar. “Mr. and Mrs. Jackson?” the surgeon asked. “Yes, Doctor,” they answered in unison. Nicole turned to see Henry just staring into space. “Henry, did you hear what the doctor said? Henry?” She called again. Still no response; Henry collapsed in the vinyl chair. With his hands still in his pockets, he began to wail, out of both pain and anger. His shoulders caved in on each other, his body curled in a slumped ball. He no longer looked like the tower of strength Nicole knew him to be. He was now in need of her strength. “If you’d like, I could have someone come and talk with you,” the doctor offered cautiously knowing that the suggestion being made could sometimes make matters worse. “Roberts,” he finished as he disappeared around the corner. Two hours later, the triage nurse was wrapping up Henry’s hand when the psychologist walked in. “He put it through the candy machine,” the nurse answered. “Henry Jackson, that’s my wife Nicole,” pointing outside the door. “Why don’t we all go somewhere quiet to talk?” The doctor asked. They found a nice spot in a corner outside the hospital’s chapel. The doctor explained how Jacob had been tested for drugs as well as other tests. The test for drugs was negative. So he asked them if they knew what brought on the behavior and why the cops shot him so many times. So Nicole explained that she had heard him talking to himself in the room. When she asked who it was he was talking to, he’d told her to ‘shut up’. “Did you have an argument earlier?” the doctor questioned. “Our youngest son. He was killed by a drunk driver. But that was five years ago. Jacob was acting like he was standing in the room.” He tossed me like a rag doll then bolted for the door.” he continued, puzzled. “Mrs. Jackson?” The doctor’s face now full of concern. “Yes,” she answered. Her expression said she knew more. “Um, a couple of years ago he said he saw Jared eating in the kitchen,” shrugging her shoulders. “Was that the only time?” the doctor continued to probe. “Excuse me doctor!” Henry was now furious. “This happened more than once and because of it – whatever “it” is our son is dying upstairs! But for some unknown reason, you never told me! Thanks, Nicole, thank you very much!” Knowing that asking Henry to calm down would go badly, Dr. Arnold just calmly spoke to Nicole while Henry paced the hallway in front of the chapel. “Nicole?” choosing his words carefully. “He means anybody like that crazy uncle of yours, Nicole!” Henry barked. “Um, ah, it’s not my uncle. He’s just “high” all the time. My father was diagnosed with schizophrenia”. “What? You told me you didn’t know your father and you heard he died when you were 12 years old!” Henry’s voice was so loud that the chapel door creaked open and a pair of tiny child’s eyes stared at him. “Henry, please,” Nicole pleaded. “Please, look at the kids. Come sit down,” tears streamed from her eyes. “Honey, I’m sorry I lied,” searching his face for understanding. “I was 12 when he died,” she continued. “My dad was a young man with troubles – at least that’s what people said. He couldn’t handle life,” they said. “So, he shot himself. I came home and found him holding a picture of me in his arms. Blood was everywhere – the ceiling, the walls and on his favorite arm chair. We would sit in it together to watch football games. I found him slumped in our chair with my picture because he gave up on me! That’s what I told myself. It wasn’t until I was an adult that I was told that my Dad was schizophrenic. I was only told because I was marrying you,” she held his hand. “My mother didn’t want me to have children.” She leaned back on the bench and began to cry. Henry looked into her oval face. The look in his eyes told the story of his heart. He loved Nicole. He couldn’t imagine what it would be like to carry such a burden. “Mr. and Mrs. Jackson, I believe that what your son was going through, is quite possibly schizophrenia,” Dr. Arnold said. “Do you know what made it happen? Was it football? Jared?” Nicole asked. We sat across from each other. She’s tired from the journey through the years, me from the day’s travel…She looked down staring in her hands as if in deep thought. I stared at the thick hunter green veins spreading up her arms from her hands like cob webs. Her weathered skin covered in brown spots; hair like fur all over her forearms. My eyes traveled south to her legs; arthritis had moved in, bags, furniture and all. Her scrawny ostrich legs were capped by knees nearly bigger than her whole body. She was wearing beautiful, sensible black shoes. The kind you would take to a craftsman to repair; a cobbler, whose skills the young women have no need of – they tend to throw out worn shoes. She was from a different era, she knows the value of a well-made shoe and her generation, poor as they were, kept things and repaired them often. Our eyes latched. My head tilted like the old RCA victor dog and suddenly through her cataracts blue eyes, I was whisked back to the 1940’s. I heard a swing band playing in my head; it slowly grew louder in my ears. I looked up…I was no longer on the 6 train. I was listening to the A Train and Ella was singing it. “Look,” I thought. “There she is.” She was standing against the wall wearing the same clothes, tapping her foot and gently applying bright red lipstick. She was 70 years younger, with clear blue eyes like the Caribbean ocean. I walked toward her to ask for her dance card but McCullin’s arms were already around her waist. They would have danced all night but a husky voice burst through the air and ordered the men back to their base…they were shipping out. I stood motionless as their hands, like time, slipped away. She never saw corporal McCullin again but like many girls waiting for their guy to come home, she took his name, Mrs. McCullin. Her ruby red lips parted to a half smile with warm tears dripping on her cardigan as she turned and waved to me…I heard the faint voice of the conductor in the background. As the subway doors closed, she stood on the platform searching in her bag…for her dance card.